Check out our new packs of 4 small teacakes. 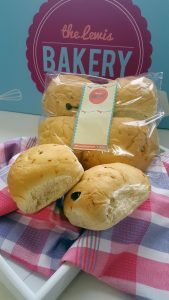 This light, sweet, yeast-based bun contains dried fruits and weighs approximately 75g. It is typically split, toasted, buttered and served with tea. The teacake is one of our summer best sellers. Available in The Lewis Bakery branded pack of 4, ready to sell in retail outlets. Don’t think this new pack is only for retailers, absolutely not. These smaller teacakes can also be sold in cafes, restaurants, canteens, bakeries and cafe ancillary outlets. Why not take advantage of the smaller teacake and ring our telesales team now on 01792 579908 to order. Available for delivery on our vans or collection at the factory.